Nutra-Nuggets Lite/Senior Dog Formula—ideal for older, overweight or inactive dogs— provides all the essential nutrients needed to maintain health, but with fewer calories. * Made with chicken meal, this highly digestible formula supports joint health, but is also tasty and satisfying. *Please consult your veterinarian before starting your dog on a weight loss program. Brewers dried rice, ground maize, chicken meal, chicken fat, dried plain beet pulp, chicken digest, fish meal, linseed, egg derivatives, glucosamine hydrochloride (0.03%), and chondroitin sulphate (0.01%). 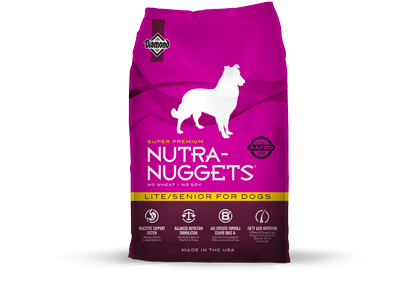 Nutra-Nuggets Lite/Senior Formula for Dogs is formulated to meet the nutritional levels established by the AAFCO Dog Food Nutrient Profiles for maintenance.